My scarves and accessories are meant to bring serenity and peace to those that wear them. I use an antique table for my work. The history of the table, a piece of my heart, and love are in each. 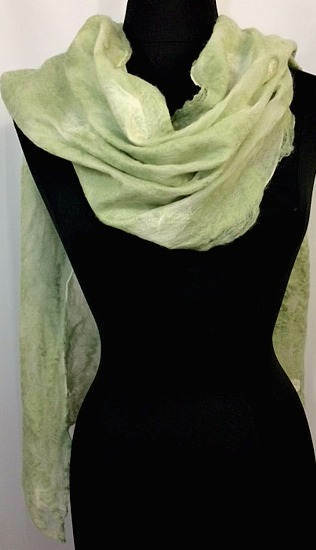 This extra long, beautiful silk chiffon scarf was inspired by a walk through a spring garden. It would be a lovely wedding accessory, or worn to dress up a casual outfit, or to compliment a dressy dress. 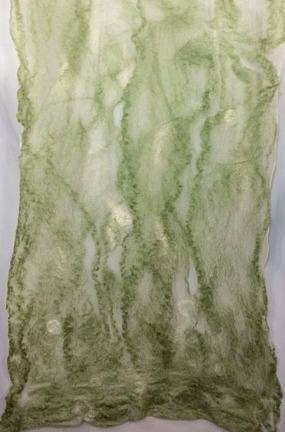 It was made through the process of wet felting with silk chiffon and pale green and white natural merino fiber. It is hand washable in cool water. Lay flat on a towel to dry. Please do not agitate, machine wash, or place in the dryer. I welcome your questions, comments, and feedback. Custom colors/themes are also welcome. Your satisfaction is guaranteed and this item can be returned within 7 days of receipt.